South America is every bit as exotic, adventurous, exciting, beautiful, enticing and inspiring as all the travel guide books, photographs, magazines and brochures would make you think - trust us, we've experienced it for ourselves! Whether you choose to visit Peru, Bolivia, Ecuador, the Galapagos Islands, or a mixture of these countries on a grand continental adventure holiday in South America, what we know is it will be an experience you will never forget. 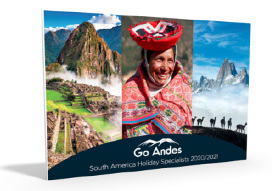 At Go Andes we fell in love with South America long ago, and we invite you to follow in our footsteps and start your journey to this wonderful destination. Travel on a holiday in Peru, and discover lost Inca ruins, staggering Andean scenery, beautiful Amazon Jungle wildlife, and award winning modern cuisine and hotels. Adventure seekers can trek the Inca Trail to Machu Picchu whilst those seeking solace can relax in spa hotels in the Colca Canyon or Sacred Valley. If you only visit one country in South America make it Peru, and set off on a journey of adventure and discovery. Often over-looked compared to other South American travel giants such as Peru, Patagonia and Brazil, mainland Ecuador offers some of the best travel experiences in the continent; and when coupled together with a Galapagos cruise holiday to the world famous and beautiful archipelago, an Ecuador holiday is certainly something to respect, admire, and cherish. Chile's unique geography has forged a country rich in wildlife and scenery creating an incredible travel destination. Visit the Patagonia region and Torres del Paine National Park with its beautiful glaciers and mountains, sip delicious wine in the valleys around Santiago, discover the lakes, rolling hills and volcanoes of the Lake District, and appreciate the barren lands of the Atacama desert. Chile is a varied and exciting destination waiting to be discovered. Argentina has to much to offer: culture, history, wildlife, landscapes and fabulous cuisine. The far northern reaches of Argentina feature snowy mountain peaks and rolling wine valleys in the foothills of the Andes, the far southern reaches are home to the lakes, glaciers and fiords of Patagonia, the Iguazu Falls are among the most impressive natural wonders in the world, and Buenos Aires is the most vibrant and exciting city in South America. What an incredible travel destination Argentina is. A true adventure destination, any holiday to Bolivia will astonish, astound, and impress. Give this off-the-beaten-track destination its chance to shine, and you won't be disappointed. With some of the most incredible scenery on earth, a local population that are as warm and inviting as you can imagine, and some of the most bizarre and unique travel experiences available, the secret is finally out about holidays to Bolivia.